really good job on this one. the eyebrow piercings make me ill. success! mask looks cool, it feels like its in the same universe as the little red riding hood. The landscape is nice too. SICKNESS!!!! Damn I wish I can do morning sketches like that!!!! your crazy at it! seriously mad skills luko. love the environment. Looking good with that mask, I like what you did with the top part of the mask design wise. You might want to bring out some of the highlights, on that part. Wow that mask thingy looks soo cool! 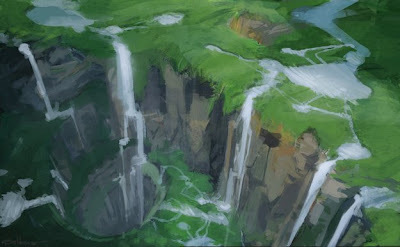 cool maaaaan... iam definetly loving the aerial shot of the waterfall! holy.... luke this is awesome! man.. your work is sick bro! dude, im really digging the mask design! i think i saw the printout version of it the day your class presented and it even looked better!